4 large pinwheel decorations in various sizes. SKU: MM45-3059 Categories: Red & Green Christmas, Paper Fans & Pinwheel Decorations, ON SALE! The Really Really Big Coloured Pinwheel Decorations are a classic Christmas decor item from Meri Meri. These pinwheels are huge! They are a great option for decorating a retail or office window or main entrance. They feature a radial stripe pattern in Christmas colours and are finished with shiny gold foil. PLEASE NOTE THAT THE RED PINWHEEL IS MORE OF A BRIGHT ORANGEY RED IN COLOUR. THE IMAGE IS NOT TRUE TO COLOUR FOR THE RED. 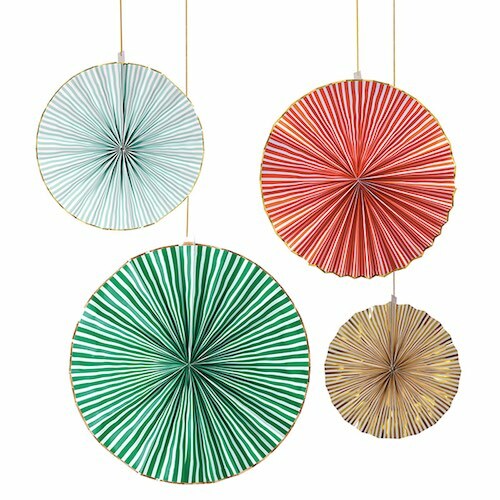 Pinwheel sizes: Green 76cm, Red 60cm, Mint Green 45cm, Gold 38cm.